Susan Street has been a published writer since 2001, specializing in health, nutrition, fitness and life-improvement articles. She holds an Associate of Arts in business administration, has additional educational background in nutrition and is also a certified personal trainer with the National Exercise and Sports Trainers Association (NESTA). 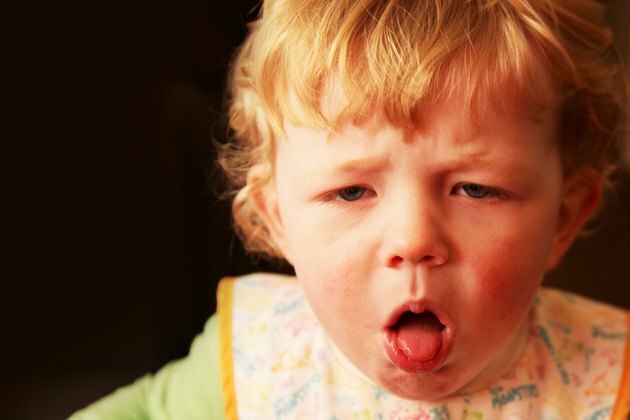 Coughs are common in toddlers, and can be caused by the common cold, whooping cough or other viruses. The Food and Drug Administration warns not to give children over-the-counter cough medicine because of the risk of overdose and side effects such as heart problems. According to an August 2007 article in the Washington Post, OTC cough medicines have never been medically proven to be effective. There are several ways to calm a toddler’s cough naturally and safely including honey, humidity, mucus removal, and increased hydration. Honey has been used as a natural cough suppressant for centuries, and is easily given to toddlers by the spoonful. 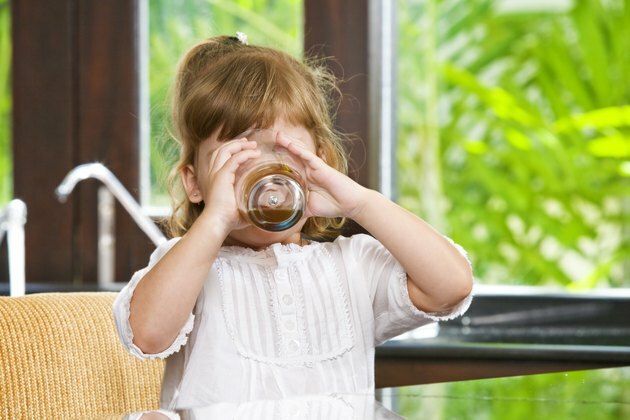 Children often enjoy the taste, and it coats their sore and irritated throat. According to a 2007 study published in the Archives of Pediatrics and Adolescent Medicine, children who were given honey before bed slept better and reported more improved symptoms than children who took over-the-counter cough medicine. ABCNews.com notes that darker versions of honey are the most beneficial because of their higher concentration of antioxidants. The only side effect of honey was the occasional case of hyperactivity. 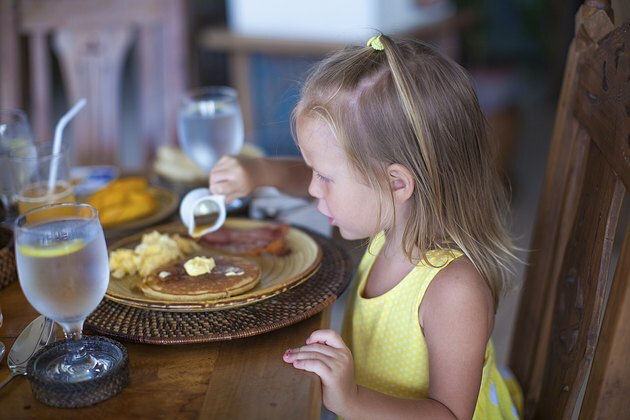 The sugar can give your toddler more energy. However, honey should not be given to children under the age of 1, since it can cause infantile botulism, according to HealthyChildren.org. Botulism is a dangerous disease that can cause weakness, paralysis and abnormal nerve function. Dry air can perpetuate a cough and cause discomfort to an irritated throat. A humidifier makes the air more humid and the resulting humidity can help loosen mucus in the upper respiratory system. 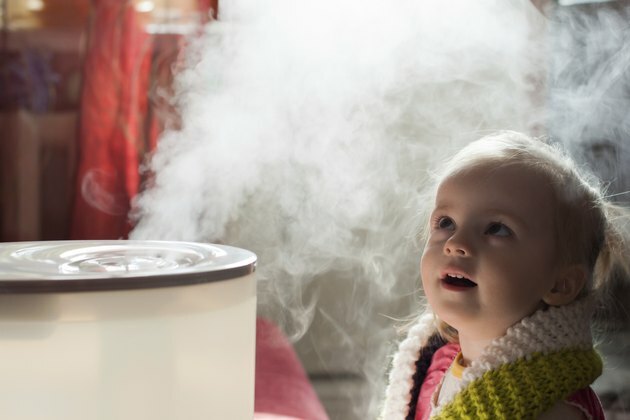 Using a cool-mist humidifier is a safe and effective way to calm a cough, and the humidity from a hot shower or bath can be beneficial as well, according to Kids Health. When leaving a humidifier in a child’s room overnight, cool mist humidifiers are a safer option than hot because of the risk of burns. Coughs are commonly caused from post-nasal drip, which occurs when mucus from the nasal passage drips into the back of the throat. Not only can post-nasal drip cause a cough, but it can cause the toddler discomfort and lead to a sore, irritated throat. To remove stubborn mucus congestion, a syringe bulb can be used to suction out some of the mucus. First, squeeze a couple of drops of salt water or saline gently into the nostrils. After a few minutes, place the bulb syringe into the nostrils, expelling the air first to create suction. Clean the bulb thoroughly after the mucus is removed from each nostril. Another effective way to treat and promote recovery from a cough in toddlers is to maintain high levels of hydration. Clear liquids naturally break up mucus, making it thinner and less likely to cause congestion. A 2004 study at the Penn State Children’s Hospital consisting of three groups of children provided two groups with cough medicine while a third group was given flavored water as a placebo. The children who drank the water reported decreased coughing and an overall improvement in health. In fact, the children taking the water had the best results, suggesting that hydration is key to healing a cough. HealthyChildren.org: Coughs and Colds, Medicines or Home Remedies?